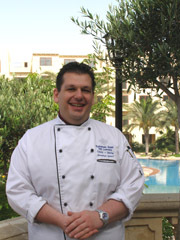 Although a native of Malta, a few of the places that Chef Jonathan's career has taken him was to Sicily for the pre-opening of the Dubbesi Restaurant at the Kempinski Hotel Giardino di Constanza Resort & Spa in Mazaro de Valley, and to Rome, Italy where he worked at the Westin Excelsior before joining the Kempinski Hotel San Lawrenz in Gozo as the Executive Sous Chef of L'Ortolan, which features an international menu with Mediterranean flavors. He brings a fusion of Asia, the Mediterranean, and North African to his kitchen using lavender infusions like they do in North African, and since there is also Arabic culture in the Maltese islands, he incorporates their spices into his cuisine. The hotel has its own organic herb and vegetable gardens, and he takes full advantage of the growing season when planning and creating the restaurant's menus, which he changes every two weeks. I met with Chef Jonathan during my stay at the hotel in June 2007, and when I asked him which chefs he would most like to cook with, he replied, "(French Chef) Alain Ducasse, (Scottish Chef) Gordon Ramsey, and (French Chef) Jean-Christophe Novelli." Method: Put the flour in a bowl, and gradually add the water a little at a time while stirring to incorporate all of the water into the flour. Let the dough rest for 10 minutes to soften. Separate dough into balls, pat into 10 cm (4 inch) rounds, lightly coat with oil and stack rounds on top of each other. Press together to form 20 cm (8 inch) rounds. Lightly sauté the individual rounds with very little oil, and then set aside. Fill each of the rounds with the mozzarella mixture. Wet one edge of the round with water, roll and press to seal edges. Deep-fry the spring rolls until golden. 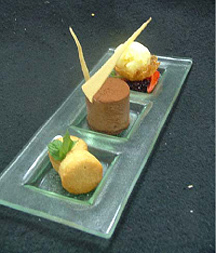 Dry on kitchen towels and serve immediately with salad leaves and Sorbet de Cassis garnished with mint. Smoke the mozzarella with apple wood and then mix with the spices and herb. Method: Place all of the ingredients in an ice cream machine, and process according to manufacturer's instructions. 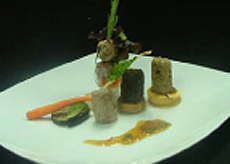 Method: Cut the blue fin tuna into 3 cylinders of 2 cm diameter x 5 cm long. Wrap one cylinder in sesame seeds, wrap one in the cracked black pepper, and leave one plain. Sear the tuna and cook in the oven for approximately 8 minutes, taking care to not overcook the tuna, as it will dry out. Sauté the onion, ginger, and lemongrass, and then add the grapes and apricot. Add sugar to taste and simmer the mixture until it reaches the desired thickened consistency. Caramelize the fig by sautéing the fig with a little sugar, butter, and a bit of water. In the meantime, roll out the short-crust pastry and fill tart shell. Prick the pastry with a fork all over, and bake unfilled for 10 minutes. Remove from oven and fill it with the fruit chutney, return the tart to the oven and bake for an additional 5 minutes. Method: Peel the tomato and cut it into small cubes. Sauté the onion, garlic, ginger, and then add the sugar, tomato, orange juice, and orange zest. Reduce over low heat until desired consistency is reached. Method: Melt the chocolate in a bowl over a pan of simmering water. Soften the gelatin leaves in ice water, drain from the water, and then add to dissolve completely in the melted chocolate. Combine the glucose, sugar, rum, coffee extract, and water and cook in a pan until the temperature reaches 118° C (245° F). Meanwhile, using a whisk attachment, whisk the egg yolks and pour over the sugar mixture. Whisk the cream until soft peaks form and fold into the chocolate, and then fold in the egg yolk mixture. Put a sponge cake base into a mold and then add the chocolate mixture. Place mixture in the refrigerator and chill for several hours until set. Method: In a pan, combine the cinnamon paste and butter and cook until golden brown. Sieve the mixture and add it to the ground almonds and the flour. Whisk the egg whites and slowly add the sugar to the egg whites. Fold the beaten egg whites into the flour mixture. Pour the batter into molds and bake at 180° C (350° F) until golden brown. Method: Combine all ingredients in a pan, and bring the mixture to a boil. Let the mixture cool, and then process in an ice cream machine, according to manufacturer's instructions. Method: Combine all ingredients in a bowl and cream together. Chill in the refrigerator to set. Roll into small balls and bake at 200° C (400° F) until golden. Remove from oven and immediately drape over a mold or cup before the cookies cool completely.